As I posted a black and white photo last week, I have decided that I will do all photos in September in monochrome to keep it fair. Some photos look stunning with no colour in them, and I was trying to take photos of flowers earlier in the week, but they were too light so didn’t stand out well. This one did though. This entry was posted in Photography and tagged Black & White, Flowers, Life, Monochrome, Nature, Nikon, Nikon D3000, Photo of the Week, Photos, September. Bookmark the permalink. For some odd reason looking at the photo, the black and white made it not seem quite real…I find that odd that the lack of colour can tell the senses something different. I love the monochrome direction, I look forward to the next. Thanks Ste J. I have been playing with a few that I have taken today and yesterday, to see how they look in Black & white. 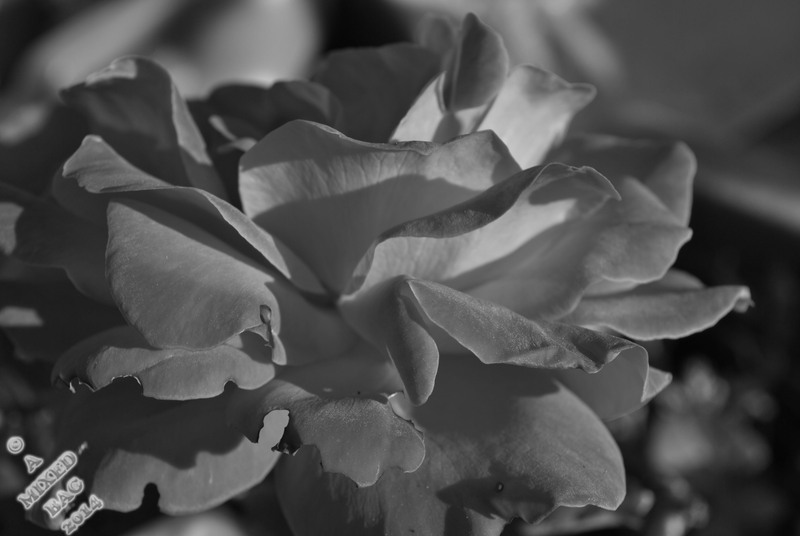 I really do like this flower in black and white. Just as lovely in b & w, Al! It sure is..in a mysterious way. I’ve edited quite a few to black and white, too, and it’s interesting to see the difference…have a great Sunday! It is. The shadows tell so much more. Have a good day. I think it would look even better with even more contrast! Wow, it’s stunning what the change does in terms of what you notice in the picture. Very well done! Lovely Al….just lovely! The lighting is beautiful!! I love black and white photographs. I think they tell a different story. One of my favorite photographers Ansel Adams does a lot of monochrome photos of landscapes. Also Dorothea Lange! Are you familiar with her?? She did b&w of migrant workers in a documentary form. Her pictures are surreal! She captures the spirit of the people she took pictures of….. I don’t know why but I love black and white!! Very good. Thank you. It does seem to give that extra mystery and depth.